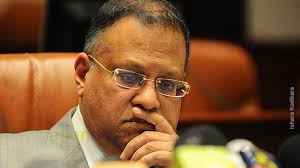 State Minister of Finance Lakshman Yapa Abeywardena on Thursday said that if the allegations listed in the internal audit reports regarding the former Central Bank (CB) Governor Arjun Mahendran's expenses were proved, legal action would be taken against him. Speaking at a press conference, held at the Finance Ministry, Abeywardena pointed out that three different internal audit investigations were carried out into Mahendran's expenses, when he held the post of Central Bank Governor. "According to internal audit reports there are serious allegations against Arjun Mahendran. The reports reveal violation of the CBSL travelling allowances rules, deficiencies relating to the credit card payments and so on. Mahendran should explain to the general public whether these allegations are true or false. But, without doing so, he is releasing media statements on the internal audit reports even without his valid signature," Abeywardena stressed. A statement released to the media recently under the name of Mahendran, raised questions as it did not bear his signature. That statement expressed Mahendran's views on the internal audit investigations. The minister said Mahendran has no right to make that statement. Furthermore, he hit out saying Mahendran's statement is suspicious as it cannot be verified. If this matter goes to Court, he can say that he is not responsible for it since it does not bear a valid signature, Abeywardena added. The internal audit review dated 01 August 2016, on the procedures adopted for foreign travel and other expenses of Mahendran, reveals that the CBSL has lost Rs. 66,280,616 due to acts of corruption, dishonesty or illegality. Rs. 34,427,772 of the total monetary loss has taken place due to the deficiencies in credit card expenses. Violating the Excise Ordinance has cost more than Rs. 300,000 to the government. Furthermore, the internal audit review accuses Mahendran of exposing CBSL to a reputation risk by outsourcing its media activities to a company which is specialized in outsourced janitorial work, not in public relations and media.